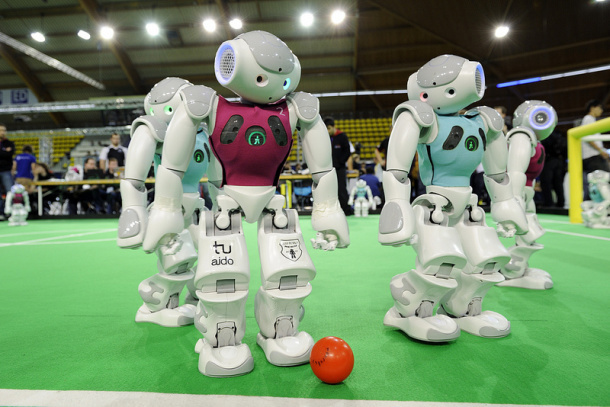 JNN 30 July 2014 Sao Paulo — Robots designed by the University of Science and Technology of China amazed the audience and won the championship for the first time at the RoboCup, which concluded on Friday in Joao Pessoa, Brazil. Recognized for their stability and precision, the robots of USTC’s WrightEagle team – dubbed Kejia – won top honors in the RoboCup@Home league, one of several leagues at the global competition, officially known as the 2014 Robot World Cup Initiative. Kejia achieved a historical mark of 8,555 points, 3,600 higher than the second-place team, after running through a set of benchmark tests. The tests are used to evaluate a robot’s abilities in a realistic, non-standardized home environment – the first stage of the competition. Following the benchmark tests, the robots wowed the audience a second time in the finals, which consisted of tasks that were designed by each team on their own. The WrightEagle team designed a program that made the robot open a tight bottle cap in cooperation with another robot, which won an additional 94 points, the highest among all the dozens of competing teams in the section. The @Home is a new league in the RoboCup that aims to foster the development of applications in the domains of service and assistance robotics, ambient intelligence and human-robot interactions, according to RoboCup’s website. “Many countries are now exerting efforts in the research and development of intelligent service and assistive robots, which is also expected to play an important role in upgrading China’s manufacturing sector,” said Chen Xiaoping, a computer science professor at USTC and the WrightEagle team leader, after the competition. The seven-member team is an emerging star in the @Home league but a traditional power in the 2D Simulation League, in which two teams play soccer in a two-dimensional virtual stadium with autonomous software programs. The high performance of its programs has given the team the championship five times in the 2D Simulation League. This entry was posted in America, Asia Pacific and tagged Humanoids, Robotics, Robots. Bookmark the permalink.